I definitely do not have enough Smashbox lipstick- -or Smashbox cosmetics in general, for that matter. 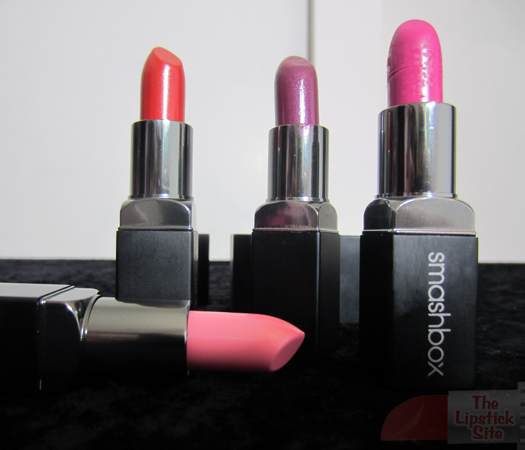 The Smashbox brand offers some really great quality cosmetics, and they have a really fun vibe. I received my first Smashbox cosmetics several years ago as a holiday gift from my aunt, and I just thought she was the coolest aunt ever for not only understanding how much I would love the gift of makeup, but also for turning me on to my new favorite brand. I’m a sucker for good packaging, and just love the contemporary style of the tubes. 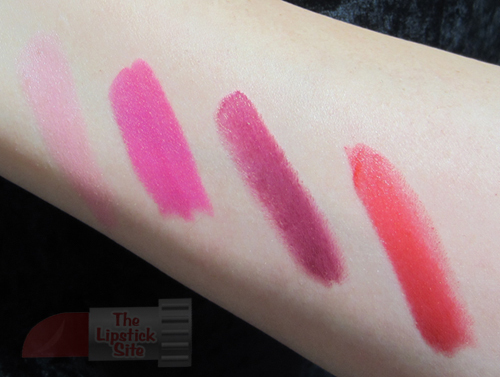 At the bottom of the below photograph, we have Smashbox “Be Legendary” lipstick in Pout, and then from left to right we have it in Legendary, Vivid Violet, and Fuchsia Flash. I really don’t have anything negative to day about these lipsticks. I love each of the colors, although I have to be in the right mood for any *really light* pink. And it was my bad, but I turned up Fuchsia Flash too high and pressed too hard while applying, so the lipstick broke off at the bottom. No biggie, because I just don’t turn it up so high or press so hard anymore, and I can still use it. Kind of by mistake, I discovered that these shades mix wonderfully. I applied a bit of each color (except for Pout) to different areas of my lips, rubbed my lips together, and was wowed at the result: a super pretty new color of its very own. I would love to do more mixing and matching with these lip colors once I have a bigger collection. The texture, consistency, and pigment level these lipsticks are uniquely perfect, and they smell nice, too. I would definitely recommend them as a gift, for yourself or someone else. This entry was posted in Lipstick Reviews and tagged lipstick, lipstick blog, lipstick review, smashbox, smashbox lipstick, smashbox review, the lipstick lady, the lipstick site by . Bookmark the permalink.